Which parent-child class should we take? All classes can accommodate younger or older siblings, so what do you do if both children are not within the same class age range? 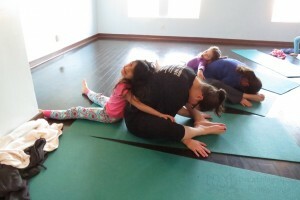 A 5- and 8-year-old – Family Yoga (4-8 yrs) with the older enrolled at half price. Sibling discounts are automatic; just sign up both children. 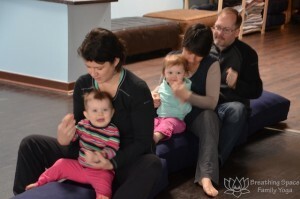 What’s the difference between Tot Yoga and Little Family or Toddler Family Yoga? 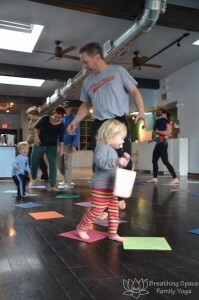 Our Tot Yoga (crawling-24 months) and Little Family Yoga (21 months-4 yrs) have a 3 month age overlap on purpose. Personality, more than physical development, should be the deciding factor between the two classes. 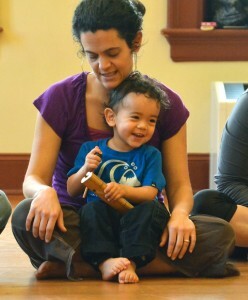 Tot Yoga tends to be a quieter class with more repetition from week to week, so suits more reserved toddlers better. Little Family Yoga tends to be louder and move move more quickly from activity to activity to suit the energy level of 2-4 yr olds. Little Family Yoga requires more verbal direction following, incorporates more imaginative play, and typically involves less physical helping from parents. 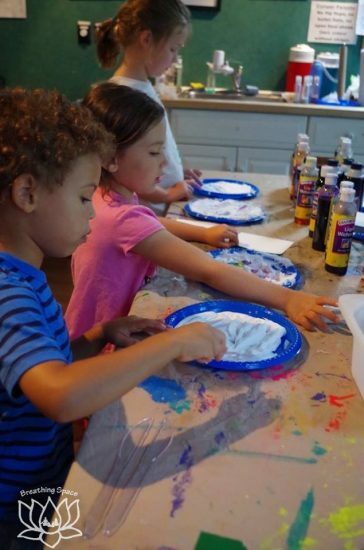 Very active almost-2 year olds often do well in this class because the social environment challenges them more than that of the younger group. 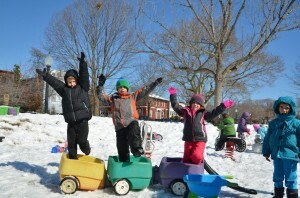 Younger siblings accustomed to the energy and speed of older toddlers and preschoolers tend to enjoy this class as well, even if they are not able to do every pose. 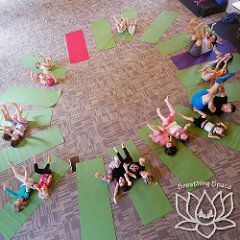 Toddler Family Yoga (walking-4 yrs) is a crossover class which is very much like Little Family Yoga with some adaptations 12-21 month old students. 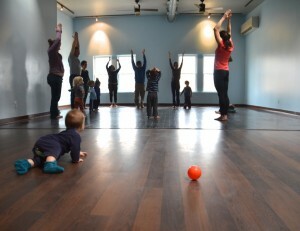 Baby Yoga & Play classes are offered in 3-6-week series. Full registration required, no drop-ins. We know it’s hard to get out of the house with a newborn, that naps are sometimes unpredictable, and life can be complicated . . . and that’s why we are requiring series registration for this class. Committing to the whole series makes it infinitely more likely that you actually attend. It far too easy to say “oh, I’ll go next week” if you are planning on dropping in. If you end up with an unavoidable conflict, illness, or disrupted nap-time, you can take advantage of our generous makeup policy. bring a friend to class as a makeup. See makeup class FAQs for details. Partial registration: If there is room in the class once the series begins, late registration will remain open for the first 1/3 of the series. Registration automatically prorates. If you can’t complete a series but can commit to 2/3 of the series in consecutive weeks – say because you are going back to work before our series ends – contact us about partial enrollment. If a full series conflicts with work or travel, feel free to attend multiple times a week during the weeks you can attend. If you are going back to work and baby will be home with a nanny or other caregiver, feel free to have them attend in your stead. Do you do sibling discounts? 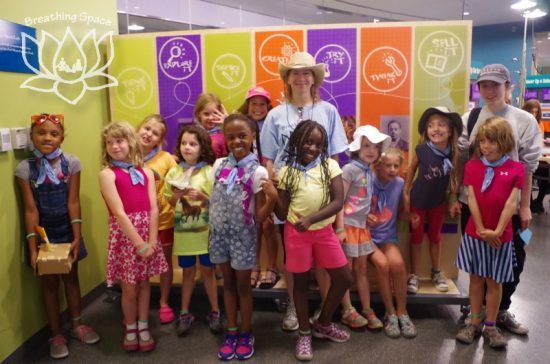 Siblings attending the same class are eligible for 1/2 price registration. Children older than 1 yr must register (no charge for infants younger than that). 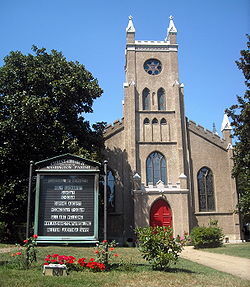 See our pricing and discounts page. Typically we can accommodate siblings 1 year younger than the stated age range, so 1 yr olds in Little Families Yoga (2-4 yrs) and 3 yr olds in Family Yoga (4-8 yrs). Can I take [insert class name here] as a makeup? If you or your child falls into the proper age range for the desired makeup yoga class, yes you may. 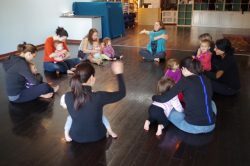 Parents of registered children may take a makeup in Prenatal or Baby & Me Yoga. Your teenager can take a makeup for your toddler and vice-versa, so long as the student attends an appropriate class. 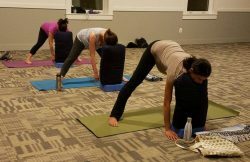 Any weekly yoga class is open to make-up students, even if they are marked FULL (though please give us a heads up in that case). No makeups in short-series or single-class workshops: Infant Massage, Baby & Me Sign Language, Beyond the Bump prenatal or postnatal workshops . . . Breathing Space is happy to offer gift certificates, but does not have an automated system for redeeming them. Gift certificate purchases must be done in advance and cannot be redeemed in person at class. Step 1: Create your account in our registration system. Please add any relevant family members. Any “register” link will take you to our class registration system. Step 2: Contact us to apply your certificate value. Please note that we process credits as quickly as possible, but it may take a few days to complete your request.